Of the roughly 4,900 dogs that the United States used in Vietnam, around 2,700 were turned over to the South Vietnamese army, and a staggering 1,600 were euthanized. Today, military working dogs are no longer left in war zones like they were in Vietnam. But until 2000, it was legal and common practice to euthanize military working dogs, known as MWDs, at the end of their useful service. Historically viewed as “surplus equipment,” they weren’t seen as having value beyond the military purpose for which they were trained. That mindset has changed dramatically, due in no small part to the public’s growing awareness of how these animals were treated after years of dutiful service. But it was one military war dog in particular – a dog named Robby – whose own fate changed that of other MWDs to come. Robby’s Law (H.R.5314) was signed by President Bill Clinton in November 2000 and required that all MWDs suitable for adoption be available for placement after their service. Unfortunately, it was too late to save Robby, whose former handler fought valiantly to adopt him, to no avail. CURRENT Title 10 U.S. Code § 2583 – Military animals: transfer and adoption (AKA “Robby’s Law.”) This is the most recent and was signed into law on 12/23/16. It gives handlers first priority among other changes, and also introduced language about contract working dogs (as such term is defined in section 2410r) that have been transferred to the 341st Training Squadron at Lackland Air Force Base. The original “Robby’s Law” can be found here. 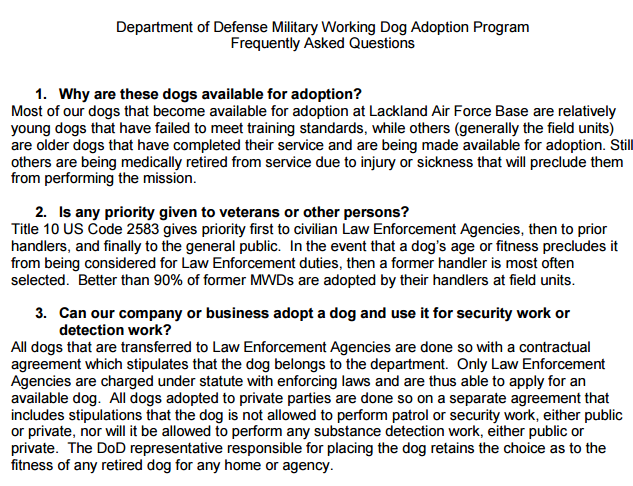 During the 2014 TEDD adoption events, the order of priority was described in bullet #2 in the screenshot below, and the full version of the DoD’s MWD Adoption Program FAQs effective during the TEDD adoptions is available here: AFD-120611-035 DOD Adoption FAQs (since the official 341st Training Squadron MWD adoption information website does reflect the latest revisions). We have included this information so you can understand what SHOULD have been followed for the TEDD adoptions. Bullet #3 means that Soliden Technologies (along with any other private contractors that we aren’t aware of) should NOT have been allowed to acquire these MWDs. THE FOLLOWING SCREENSHOT IS ONLY SHOWN TO DOCUMENT THE PRIORITY THAT SHOULD HAVE BEEN FOLLOWED DURING THE DISPOSITION OF THE TEDD MWDs in 2013 and 2014. It is not current.